Since enough people have asked about it, here's an explanation of Marvel's many objects of ultimate power, and how they tie to the Marvel Cinematic Universe. Consider this a primer to help figure out all of the references to "Infinity" in the movies. ​All your Questions about Thor 2&apos;s Multiple Endings -- Answered! In the comics, there are numerous devices that can give limited god-like power. These are called Cosmic Containment Units. The first-revealed unit is the Cosmic Cube, of which their have been many. The Red Skull most often goes after one of the Cosmic Cubes to reshape Earth in his image, but - as with all wouldbe gods - he is always done in by his own hubris. Interestingly, the Cosmic Cubes often gain sentience, becoming entities unto themselves. One theory suggests that the type of people who use the cube affect that type of entity it eventually becomes. Collecting several Cosmic Containment Units can give universal god-like power. The girl sitting in tantric position surrounded by floating glowy stones is the aptly named "Goddess" and she collected them to make a more peaceful and ordered universe (whether people want it or not). She merged all of the units into a single Cosmic Egg, but she too was eventually undone. Her progenitor, Adam Warlock (who should hopefully show up in the movies before the whole Infinity shebang actually gets started) worked alongside his longtime foe Thanos to defeat her. 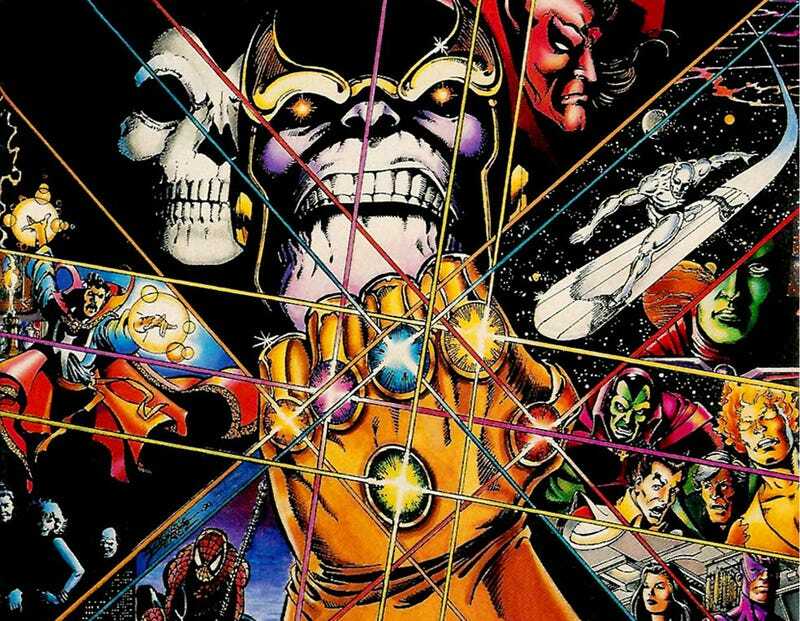 The most famous powerful apotheosizing devices are the Infinity Gems: six (or seven) baubles of finite but incredible power that, when brought together, make the bearer the most powerful entity in creation. Each gem is unique, and despite their names implying only a single use, they have been used for multiple purposes by multiple people. The Soul Gem, for example, is usually used to see into people souls or trap souls within a pocket dimension inside the Soul Gem itself, but it was once used to help create a second Earth. Soul: As stated, most often used by Adam Warlock to examine, cleanse or steal the souls of others. It is the most nebulous of the gems in terms of ability. Originally, all of the gems were known as "Soul Gems," because this was the first to make an appearance. Mind: Usually allows users greater access to the Astral Plane (the dimension of the mind) and increases any mental abilities exponentially. Most famously used by Moondragon, sometime Avenger and sometime world-conqueror. Power: Perceived as the most simplistic of the gems as it is usually used to make people stronger. With it, anyone can become a credible challenge to the Hulk, for example. Although Drax (soon to be seen in the Guardians of the Galaxy movie) used it for a while, perhaps the best Power Gem story involved the She-Hulk as she built herself up to fight the Champion (the original Rasslor) and her own enemy Titania, both of whom possessed the gem. Time: This gem has rarely seen use, although for a long time it was protected by Gamora (also soon to be seen in the Guardians of the Galaxy movie). Space: This gem can take you anywhere in the universe, and its most pernicious possessor is Pip the Troll. Man, would he be fun to see in the movies. Reality: The least understood and most feared of the gems, the Reality Gem does whatever you think it does. Ego: The least seen of all the gems, this one acts as a central nervous system for the gem set. This one will probably never be seen or referenced in a movie, and it's not necessary for the story. Thanos famously quested after the Gems, killing or conquering various immortal beings (similar to the Collector) to gather them, then wiped the floor with all Earth's heroes, then beat up all of the cosmic entities and universal abstracts (these guys haven't shown up in the movies yet, but I'm hoping Guardians of the Galaxy will at least show the Watcher). Later, after a temporary retirement from destroying the universe, Thanos tried to redeem himself somewhat; he defeated an ancient despot and found another source of ultimate power called the Heart of the Universe. Despite his good intentions, the forces of creation stood against their new god, and he was forced to destroy all of reality and rebuild it from the ground up. To be clear, Thanos was not defeated. He succeeded in destroying and recreating the universe, then gave up godhood. So where does this leave the movie universe? It's unlikely that they would confuse audiences with multiple ultimate power devices, and it seems they intend the devices to overlap somewhat for simplicity's sake. Let's suppose then, that the Tesseract seen in Captain America and the Avengers - long assumed to be the cinematic Cosmic Cube - is in fact one of the Infinity Gems. It's possible the Gem can take new shapes, or, even more likely, that the cube is actually a form of Cosmic Containment Unit, storing the gem for later use. So if it is a gem, which one is it? The most likely candidate would be the Reality Gem, as reshaping reality is what the Cosmic Cube is all about, however it has never been shown to do this in the movies. The next possible candidate is the Power Gem, as that's what Zola was able to draw from it to get all those cool weapons working, but this was more of a side effect of Zola's siphoning device, not so much the gem on it's own. It's been suggested that it could be the Mind Gem, as Loki used it to control so many people, but in the Avengers movie, he was said to be channeling powers from his mysterious benefactor (i.e. Thanos). So, my theory? The Tesseract is the Space Gem (or a box containing it). Its primary use in both Captain America and the Avengers - when used on its own without someone trying to figure out what it was - was as a portal to somewhere else in the universe. Heck, even the church that housed it at the start of Captain America saw it as a connection to the gods. So where did those other uses come from? Again, the gems can be used for multiple purposes, and even the residual energy from the gems is more than anything humans could create. How about the Aether in Thor: Dark World? If it was one of the gems (as implied, but not stated), it's possible it was the Reality Gem, as it could recreate reality with the right set of circumstances. Does that make everything infinitely clearer? UPDATE: Saucifer was cool enough to point out that producer Kevin Feige has confirmed that the Tesseract is, in fact, the Space Gem. The source article states explicitly that the Aether is another gem, although it doesn't say which.